Bhagirathi and Ganga - Why Ganga River is known as Bhagirathi? In the Himalayas, Holy River Ganga is known as Bhagirathi. The reason why Holy River Ganga is known as Bhagirathi because it was King Bhagiratha's desire to free the souls of his ancestors that brought Holy River Ganga from heaven to earth. He performed intense austerities (Tapas) first to Ganga to come down to earth. When Ganga agreed, there was a problem as her fall from the sky to earth will destroy Mother Earth. To overcome this problem the king performed Tapas for several years to Shiva. 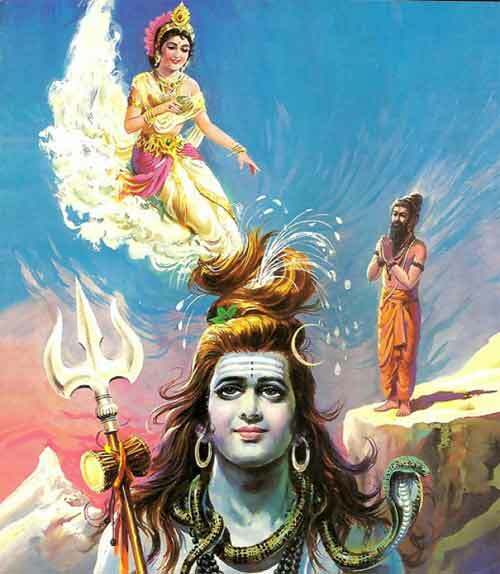 Only Mahadev could capture the might fall of Ganga to earth. Shiva agreed. In memory of the intense austerities performed by King Bhagirathi to bring Holy Ganga down to earth, the river is known as Bhagirathi in the Himalayas and is an important distributary in Bengal. After traveling for about 2,075 kilometers in hills and plains in the states of Uttarakhand, Uttar Pradesh, Bihar and West Bengal, the Ganga River divides into two distributaries, Bhagirathi and Padma in Murshidabad in West Bengal. River Padma flows in southeast direction through Bangladesh where it meets Brahmaputra and Meghna Rivers, finally merging in the Bay of Bengal. Bhagirathi River flows through Bengal mainly through Behrampur and Katwa and is joined by Jalangi River near Nabadwip. Bhagirathi River then runs for about 300 km from Nabadwip to reach the Bay of Bengal.